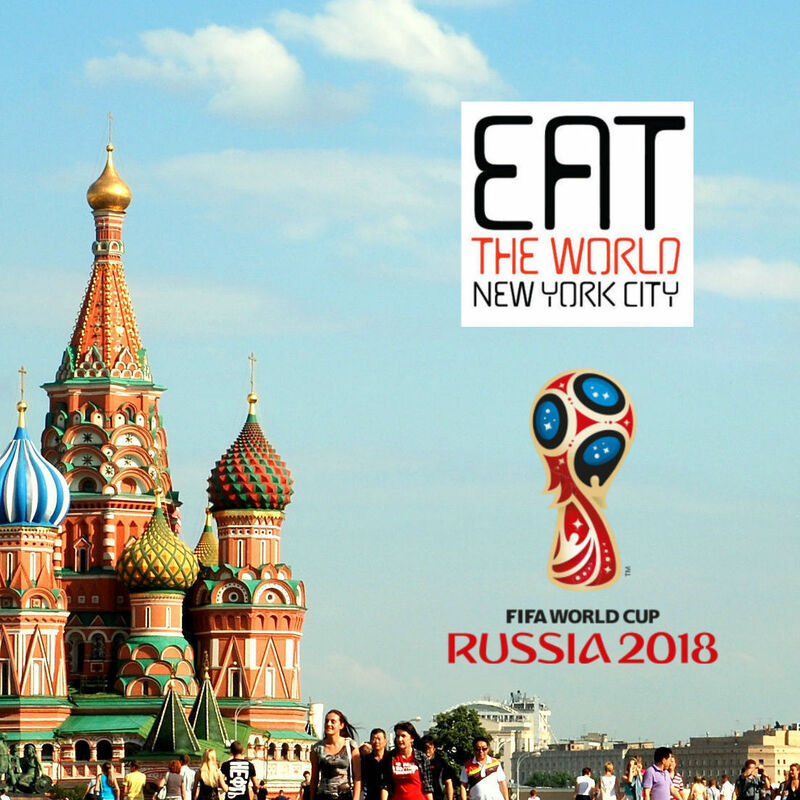 Colombian restaurants in the Jackson Heights and Corona neighborhoods of Queens are a dime a dozen. Whenever I am in the mood for this cuisine, I find myself going back to the same places that I know are good, but I recently decided to change that and head into a few more of the better looking locations. Personally I think that better Colombian food is to be found in New Jersey neighborhoods such as Englewood and Elizabeth. I'm hoping I can change this attitude with the right finds in Queens. 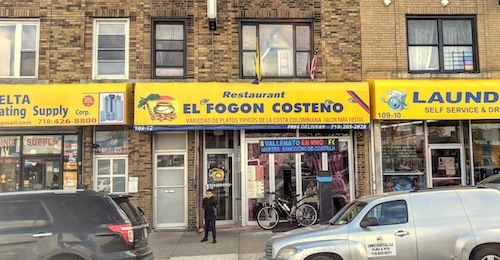 The first location I decided to descend upon in Corona is the well out-of-the-way El Fogon Costeño, a restaurant that is actually owned by Uruguayans and promises specialties from the Caribbean coast, a distinct subset of food from Colombia. The menu is large and covers most of the country's usual "hits" though, as well as a nice focus on seafood dishes. The restaurant has a full breakfast menu which I have not tried, and being open for three meals leads me to believe that there is something special about this place, which is not only a decent distance from the majority of Colombians in Jackson Heights, but out of the way to most people in general. Economical lunch options each day are what to come for, in my opinion. Each day has a different special, priced from $6 to $8, and is plenty of food for one person. The empanadas de carne ($1.25, above) are satisfying and not too greasy. Add the aji they give you at the table to give the meat and potatoes a little zing. Alongside the empanadas, an arepa con huevo ($2.50, below) is a common sight on the streets in cities near the coast, especially early in the day. We tried the one here, which is very good and made me want to be enjoying it on the beach. Also of note are the carimañolas de carne ($2, below), similar to the empanada but made with yuca. It is a simple snack also common for breakfast in the Caribbean region. 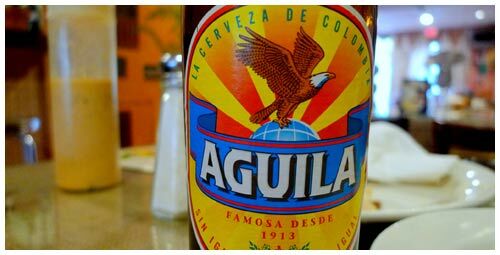 Between courses is a good time to enjoy the rest of your first Aguila and the start of your second, as well as the hodgepodge of various Colombian murals and knickknacks decorating the place that have no scheme or focus. Vallenato music plays on the sound system, sweeping you away in spirit right to the coast. Friday is a day worth seeking out this place for, which is exactly what I did on my return visit, specifically for the sancocho El Fogon ($7, below) the special of the day. It has a mixture of meats and entrails in the hearty stew, potatoes and yuca. It is served with a plate of rice, which you can dump into the soup or take spoonfuls of and add broth, satisfying either way. A pleasant surprise of chicken heart in the sancocho! The rest of the menu is expansive and difficult to select just one thing. 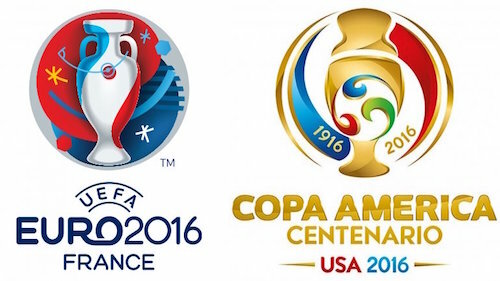 Having a group of five or six would be a real asset here. On our first visit, my Colombian friend and I were excited to try the sobrebarriga a la criolla ($13.95, below), a grilled steak with a sauce dominated by red and green peppers. It is mild despite its appearance, but full of flavor. We asked for a side of coconut rice ($5, below) but they can swap it for the regular white rice for just $1 extra. This is a good order, another specialty of the Caribbean coast. When we asked for some recommendations from the seafood menu, something we completely neglected, the server mentioned that the cazuela ($17.95), a seafood stew, is excellent. On our next visit, we will have to tackle this portion of the menu, hopefully with a big group.